Text to speech (TTS) is a form of speech synthesis that converts text into spoken voice output. With the aid of Text to speech software, you can give your documents and files their own voice, relax and let them read the contents out for you. 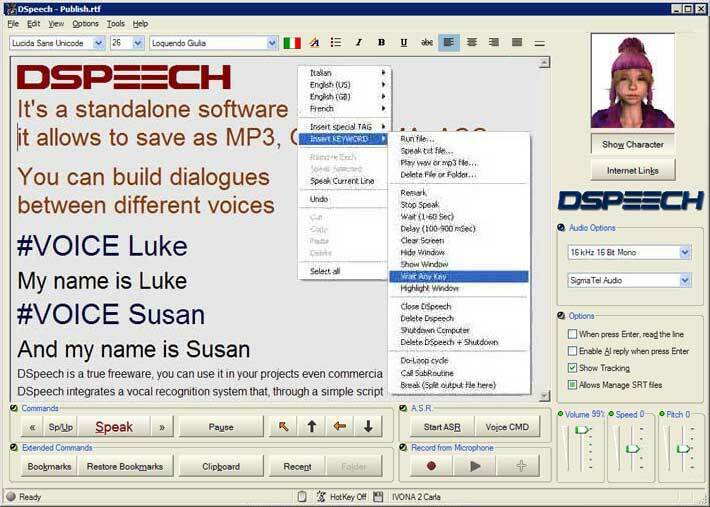 An example of this kind of software is this program that helps you to read your text using its Automatic Speech Recognition (ASR). The tool interface provides you with easy access to the basic functions, voice and reading mode included. The application gives you an option to select the voice you want to read the text, tune the sound to your liking, as well as record the reading and save it as MP3 or WAV. The application features a vocal recognition system which enables you to create interactive dialogues with the reader. It also comes with Shortcut support, allowing to change voices, tune the volume, or vocalize the written content by clicking on the pre-defined key combination. The beauty about the tool is the full access it gives you over the voice settings (volume, speed). The application is lightweight and uses a minimum amount of system resources. It requires no complicated processes, the application is intuitive enough for everyone to use. 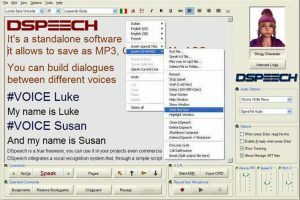 DSpeech is licensed as freeware for PC or laptop with Windows 32 bit and 64 bit operating system. It is in other tools category and is available to all software users as a free download.